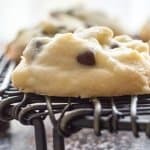 These Easy Chocolate Chip Whipped Shortbread cookies are the absolute melt in your Mouth Shortbread Cookie. Fast, Easy and they will be gone in seconds. We are big lovers of Shortbread Cookies and a couple of our favourites are My Mom’s Shortbread Cookies and these delicious Lemon Shortbread Cookies. We are getting closer and closer to Christmas, well it is October, and isn’t that close enough? People who know me, know how much I love Christmas. So I thought why not start sharing some of the wonderful Christmas cookies I grew up with. My Mom’s Christmas Cookies were the best on the block. Including these Whipped Shortbread Cookies. These literally melt in your mouth! My kids actually prefer these over the Classic Shortbread. When I started to make these here in Italy I noticed that they were always flatter than my Moms’. I knew it probably had something to do with the flour, I even tried refrigerating the dough for a few hours. But nope, flat they stayed. They still tasted the same, but I really wanted them to look like my Moms’. So when I was in Toronto I made some at my sister’s and Yup, they came out all puffy and glorious looking. So now I know Canadian Flour and Italian Flour are different. But how are they different? It turns out that you need a flour with a protein percentage of 12 or more to prevent flat cookies. Luckily enough the Italians don’t mind them flat and as a friend of mine always say, “I can’t wait for Christmas just to receive your delicious cookies”. I usually make 4 or 5 different types, but these Whipped Shortbread are so good that I keep making them every year. And of course these can be made in advance and frozen too for up to 2 months. It was quite a risk this week when I asked my youngest daughter to put them in the freezer for me! Although she did eat a couple on her way to the freezer. Make sure to let the cookies cool completely, then freeze the cookies on cookie pans that are lined with parchment paper once they have frozen, then place them in air tight freezer bags or containers. You don’t want the cookies to stick together! 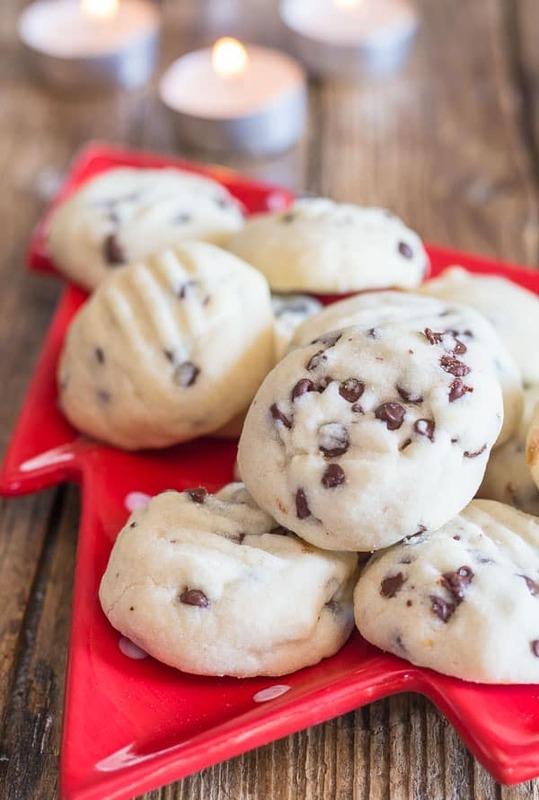 You can also freeze the dough, make the dough balls and place them on a parchment paper lined cookie sheet, once they are frozen place in an airtight container or bag. The cookies can be baked frozen, just be sure to add an additional couple of minutes to the baking time. Your baked cookies should be left to cool then store them in an airtight container at room temperature they will last up to 5 days. I like cold cookies so I actually store mine in the fridge, they will last up to 10 days in the fridge. 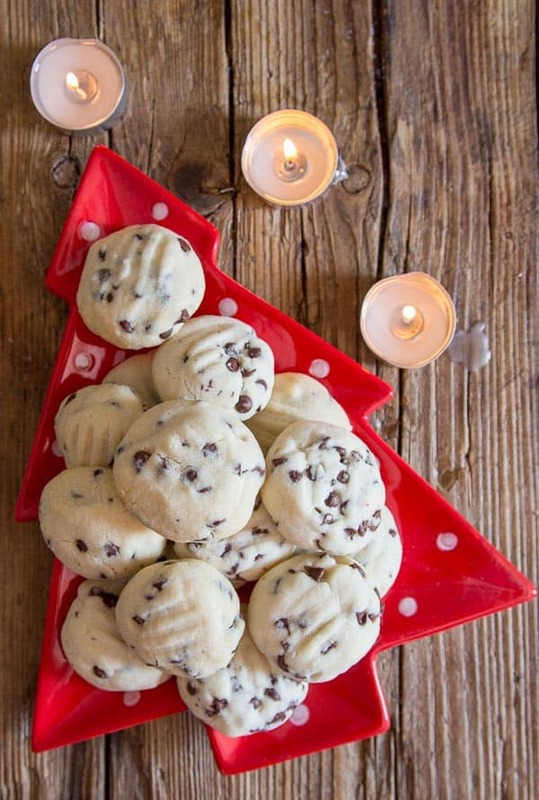 Nobody can resist these Chocolate Chip Whipped Shortbread! I hope you enjoy them as much as we do. Enjoy! One of the best Christmas Cookies, melt in your mouth shortbread. *If you use salted then only add a pinch of salt. Pre-heat oven to 325° (160° celsius). In a medium bowl cream butter and icing sugar till very fluffy. Beat in salt, cornstarch, vanilla and flour. Beat until very light, stir in chocolate chips. Drop by teaspoon full (or roll into balls the size of a golfball and lightly flatten with a fork) onto parchment paper lined cookie sheets. Bake for approximately 15-20 minutes** (until very lightly golden (almost white) never browned). Let cool completely. Enjoy! ** Start to check the cookies after 10-12 minutes, depending on the size they may take less time to bake. Reposted from October 5, 2016, because they are so worth it! Thank you so much for sharing this recipe! It is the exact cookie my grammie used to make when I was her shadow at the holidays. When she died the recipe went with her, we couldn’t find it anywhere. I had no idea what to call them since she always called them My Baby’s Cookies. I am making a batch tonight and taking it to my room to cry like a goofball and remember. Thank you. Now I have something to make for the light in my life who will follow me around at the holidays. Hi Rhiannon I am so glad I could help you find your Grammie’s cookie recipe and be able to share it with your little light of your life. My daughter makes them too during the holidays! I hope you didn’t cry too much, although sometimes that is exactly what we need. Have a wonderful day. How can Store the cookies? Can I freeze the dough to bake them after? Thanks ! Hi Loli, they can be stored in an airtight container at room temperature from 5-7 days, or frozen for up to 2 months. If you want to freeze the dough then you should place the cookie balls on a cookie sheet, freeze them then place them in airtight bags. Hope this helps. Just made your Easy Cinnamon Cake and my husband said it was excellent.Soooo moist, Love your recipes..Keep them coming..
Hi Dorothy, thanks so much, so glad you enjoy it. Happy New Year. Hi Sherrie, thank so much, so glad you enjoy them. And I hope you enjoy the other recipes too. Happy New Year. My go to shortbread cookie, perfect every time. Thank you for sharing! Hi Lucielle, thanks glad you like it. Merry Christmas. Hi! These look so good but I don’t have corn starch, is there anything I can use instead? Hi Elissa, there really isn’t anything you can substitute for cornstarch in a shortbread cookie, cornstarch makes the cookie more tender and helps makes them melt in your mouth. You could try using one for one with flour and see how they turn out. Let me know. Oh My Gosh…I just made these, and had to try one before they cooled off, They were the best! I made the mistake of chilling, because that’s what I do with my other cookie recipes, and it took awhile to be able to shape them, so I have to remember to NOT do that again. Thanks for this amazing recipe! Hi Janet, thank so much, so glad you like them, that’s the good thing about these, no chilling necessary! Merry Christmas. Hello, I would like to clarify which sugar to use instead of icing sugar-powdered sugar or granulated? There are conflicting comments but my guess is powdered sugar. Thank you! Hi Angie, yes powdered sugar as written in the recipe. Hope you like it, Merry Christmas. Can you use regular sugar instead of icing sugar. Hi Angie, I would use granulated because the icing sugar gives the shortbread that melt in the mouth taste and it would change the texture of the cookie. Dekicious! For those who watch their salt intake like myself, I didn’t add salt. Even with unsalted butter and no extra salt, they were awesome! Hi Debb, thanks so much, so glad you enjoyed them. And Happy Holidays. What is your recommendation for storing the freshly-baked cookies? I do. Or want to freeze them. Hi Wendy, you should let them cool completely before storing, and they should be stored in an airtight container, with parchment paper between the layers, some people say to add a piece of bread to keep them fresh and also they should be stored at room temperature. Hi Lin, I think if you really packed them well so they couldn’t move around and the box was really firm then yes it would probably work.Hope that helps. Let me know. Is it unsalted or salted butter!!? These look amazing – I can’t wait to make them for a family get together this weekend. Quick question – does the butter need to soften to room temperature? Want to make sure I follow the steps to get them looking as scrumptious as yours! Thank you! Hi Sajeda, Yes the butter should be room temperature, thanks for that I just updated it. I hope you enjoy them, let me know. Hi Chrissy, thanks so much, so glad you enjoy the recipes. I always freeze them and they taste just fine when they are thawed. 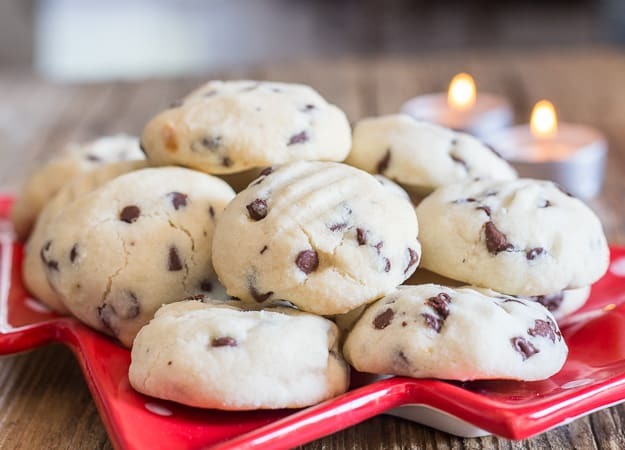 The best way to thaw them is to remove the frozen baked cookies out of their containers and place them on a paper towel-lined plate, and let them thaw at room temperature. Hope that helps. Hi Gina, your welcome and so glad you enjoyed them. I’m glad you found my website too! 🙂 I hope you enjoy the recipes. Hi, can I use caster sugar instead of icing sugar? Will it affect the consistency? Hi Kelly, I have never made with with caster sugar, although I know caster sugar is fine just not as fine as icing sugar. But I would say try it, I think it would work. Let me know. Can you use regular size chips ? Hi Mary, sure that’s fine, I use mini because that’s all there are here. Have a wonderful Christmas. We were looking for something that was as simple to make as plain chocolate chip cookies, but that was more exciting and unique. We plan to give them as gifts to my daughters’ school teachers for the Holiday. These were so simple to make and they taste delicious. We aren’t used to shortbread in this house, so the texture really surprised us when we first bit into one. (I discovered I think they taste even better if you don’t chew them and mush them in your mouth, instead). They’re so soft and very enjoyable. We think the teachers will love them and will have to send them right away so that we don’t eat them all before they get there! I really want to try dipping one in my coffee tomorrow! Hi Katy thanks so much and so glad you like them and I think the teachers will like them too. I think these are probably the most underrated shortbread cookies, whenever I make them they are gone in seconds. Have a wonderful Christmas. Hi Judy, sure you can add nuts, my Mom did but you really don’t have to chill them before baking. You can if you want. This recipe is terrific! Awesome! The texture is truly the kind that melt in your mouth. I’m so thrilled by the result. I tried it immediately once it cool down (took me less than 5 min, from the point I removed it from oven). Thank you for the additional notes. This is my first time baking using this recipe, I baked it at 165C for 20 min. Lightly brown not as white as seen from the pictures you have shared. I like a little more color to it. I have added walnuts – it gave great texture to the shortbread. I have also substitute the icing sugar to cane sugar (1/4 cup) – the semi sweet choc-chip provides plenty of sweetness to it. Overall, loving it! Hi Chrys so glad you enjoyed them. My Mom always add walnuts too and thanks for sharing how you made them, have a wonderful Christmas. Hi, I made this recipe today and the cookies are crumbling when I touch them! What did I do wrong? Are they underbaked? They’re not golden at all but they had been in for 18 minutes when I finally removed them from the oven. Thank you. Hi Kristen, I have no idea why they are crumbling, did you bake them in a slow oven? Maybe they are a bit over baked, they should be very lightly golden, almost white. Hope that helps. 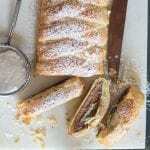 THANK YOU for posting this recipe!! These are *exactly* like my mom’s chocolate chip shortbread cookies she made every year for Christmas, which we made hundreds of because they were everyone’s favourite, and I never got the recipe. 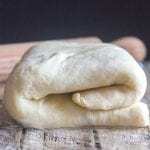 I have been searching and searching for *THIS* soft shortbread recipe forever. I dunked all the top of mine in mixed red, green, and chocolate sprinkles before baking (which is how my mother used to make hers) and these are perfect and puffy and soooooo good! Thanks a million! These are amazing! I’ve never made shortbread cookies before so I was worried about how dry the dough was getting but put my trust in the recipe and they came out perfect. Love them! I was trying to think of the perfect way to describe these cookies, and I think I finally landed on it. Delightful. Positively, perfectly delightful. Hi Sandra, thanks so much, I actually discovered that in Italy they also have a flour called Manitoba which is basically all purpose flour, so I am going to give that a try. And yes for most things I like Italian flour too. It’s also the protein content, more Protein in North American flour and less in Italian. Have a great weekend. Hi Joyce, thanks they are one of our favourites. Have a great week. These were really good, but I’m glad I checked on them while they were baking, they took only about half the time that was stated here. No idea why, but they were browning on the bottoms by 12 minutes. Hi Monica, thanks I will note that in the recipe. Sometimes that happens here, I find some recipes take longer to bake. Have a great weekend. Hi Rosemary! Are you still living over there? I lived in Roma for over 10 years. I never learned how to make cookies though! Only everything else including pasta. Interesting! Love these cookies! 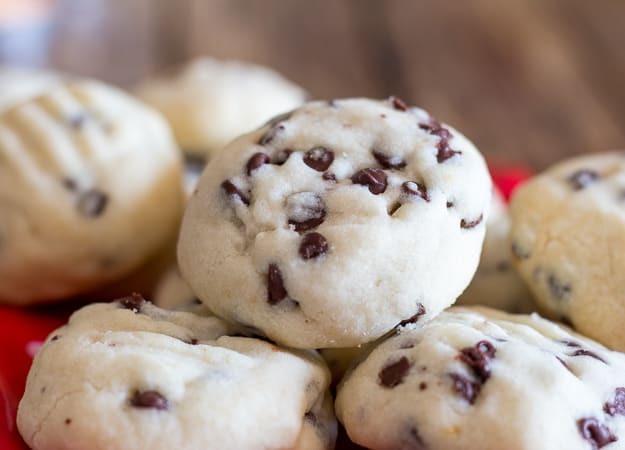 You provide the perfect shortbread recipe and add mini chocolate chips – sooo delicious! My family loved them! I am adding them to my Christmas cookie regulars and plan to make them again tomorrow….just because. Thank you for this recipe! Hi Kelly, so glad you all enjoyed them, I make them every Christmas. Is icing sugar and powdered sugar the same thing? Thank you for clarifying that icing sugar & powdered sugar are the same! I’m excited about your recipes and look forward to trying this one for the holidays. 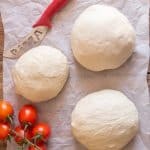 A quick question I have, what type of flour did you use? All purpose or self-rising? Why isn’t salt listed in the recipe when it’s shown in the video? Hi Thyria sorry about that it should be 1/4 teaspoon salt, I adjusted the recipe, thanks. Thanks Melissa, these are probably our absolute favourite and so easy too! Glad you like them. Have a great week. My grandson loves shortbread cookies. Just printed the recipe and definitely will be making these. Thanks for sharing. Hi Ann, thanks I hope your grandson enjoys them, let me know what he thinks. Have a wonderful Sunday. Thanks Marisa, they sure are melt in your mouth, Have a wonderful Sunday. Great! 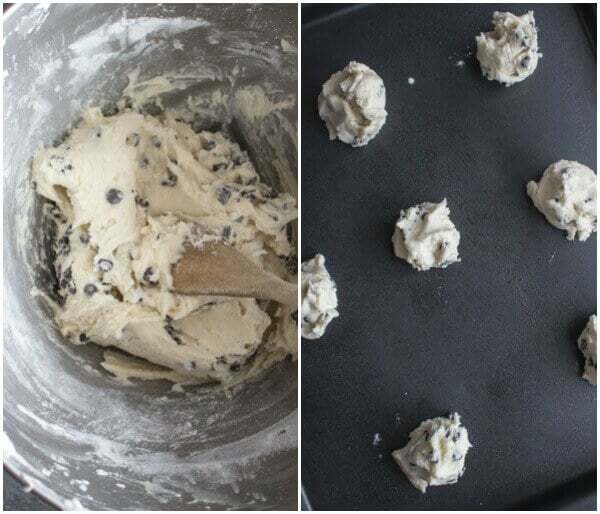 Do you freeze the cookies or the dough? Hi Nessie, I freeze the cookies, to tell the truth I never freeze cookie dough, just the made cookies. Have a great weekend. Oooh these look amazing!! I love shortbread cookies so I will have to try these soon! Thanks so much for linking up to Creative K Kids Tasty Tuesdays. I’m pinning this to the Tasty Tuesdays Pinterest Board. We would love to have you join us again this week! This looks so good! Thank you so much for linking up at Tasty Tuesday! Your recipe has been pinned to the Tasty Tuesday Pinterest board! Please join us again this week! These look so delicious! Yum. Pinned. These cookies look delicious. I make between 15 to 20 different cookies for Christmas. I’m probably adding this one this year. I usually hear about fist fights over my pizzelle. I mail them to a few friends that I don’t get to see over the holidays. Time flies by faster and faster as we get older no matter where you live. I can’t believe the year is almost over already. I am truly loving these recipes. I always look for great recipes to add to my collection. I look to cook and to bake. I also watch for recipes I can easily convert to sugar-free recipes, since my children and I cannot eat sugar. 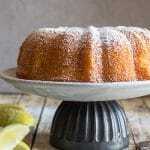 Both last week’s recipe and, especially this one, are easily converted to sugar-free. Thank you so much providing copies of your recipes for these tasty treats. Hi Michelle, Thank you, I am so glad you are enjoying these recipes and that they are easily converted for you and your children.